12 August 2009 - ERS, install Toshiba B-SA4 printers into 7 ticket offices across the FGW network. First Great Western, which operates high speed, commuter, regional and branch line train services across the former Wessex Trains, First Great Western Link and First Great Western routes, was looking for a robust and reliable solution to print tickets for their reserved seat service. Key considerations in FGW's choice were that the printers would be able to integrate into the existing National Reservation System without the need to implement costly software changes. With up to 2000 reservable services running per week - and with some 20% reserved in advance FGW wanted a product which could operate in mission critical situations. And with some tickets printed only 2 hours prior to train departure it was essential that there was no downtime. 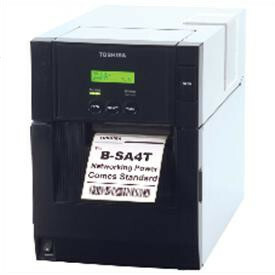 "The BCI functionality of the Toshiba SA4 printers made the upgrade from FGW's original dot-matrix printers easy to achieve and allowed the continuous use of the existing Blazepoint software". said Jon Thurlow, Account Manager at Toshiba. "Added to this the SA4 is easy to use with a simple media path and auto-calibration functionality. The compact footprint of the printer allowed easy integration into tight spaces - an important factor in small crowded tickets offices". "We are happy to be working with Toshiba and ERS on this project. The reliability and compatibility of the SA4 couldn't be beaten" said Natalie Morse, Marketing Manager at First Western Railways. Natalie continued "ERS ensured a smooth implementation and transition from our existing solution to the new Toshiba printers, and they have continued to provide service and support for any questions or queries we have, we would not hesitate to recommend the ticketing solution".